Helen Simpson, from the Mushroom Shed, interviews Heather, from Box Hill South. Heather enthusiastically welcomes Guy and myself as we arrive at her front door. We are eager to see her garden due to the expanse of food that Heather grows on her suburban block and over the next hour we are not disappointed. Around the kitchen table over a cup of coffee, Heather tells us how her interest in gardening began – firstly with the influence of her father who taught her the botanical names of plants, then later on through inspiration from a work colleague, who introduced her to newsletters from Permaculture Victoria. 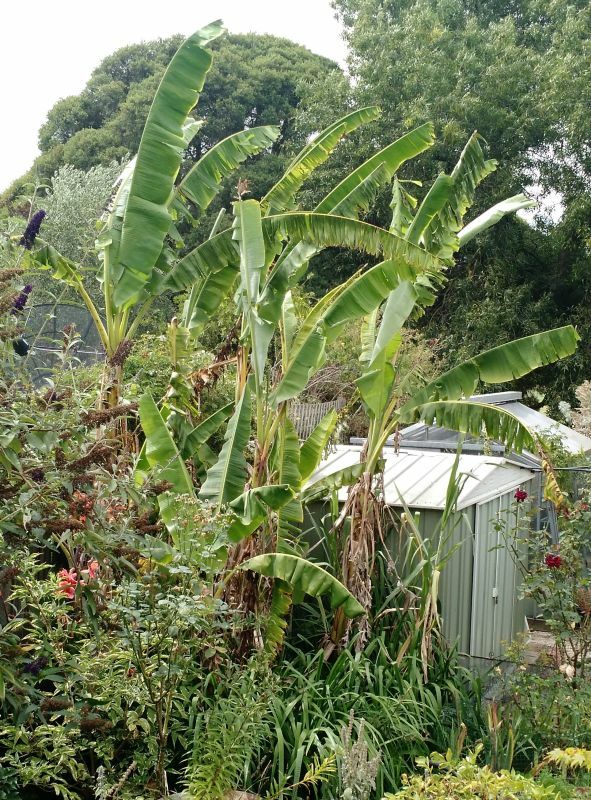 Moving to a property in Box Hill South gave Heather the opportunity to experiment with gardening and put her theoretical knowledge into practice. The 670 square metre property initially comprised solely grass and dead trees – basically an empty canvas for Heather to work with. Today this is hard to imagine, as everywhere we look edible plants spring forth and the only patch of lawn is a small section reserved for relaxed seating. 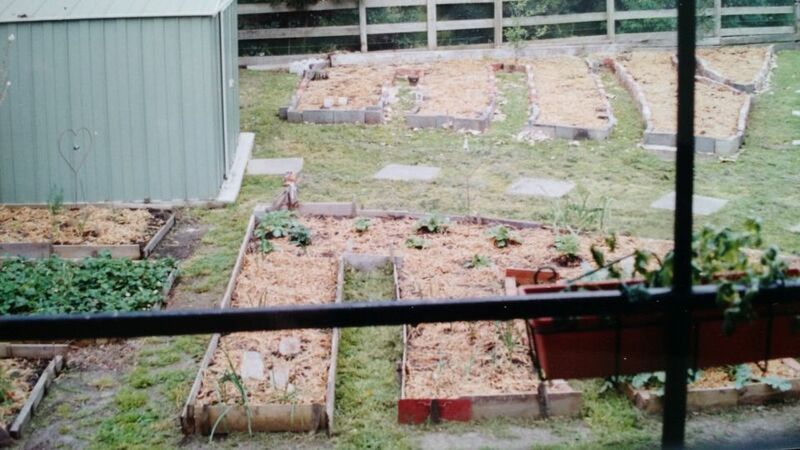 Heather tells us that she originally started the garden with one small square of about 1 metre, then kept adding more, and more … and more. Her garden is basically divided into 4 segments, with curved, rather than straight, paths providing the illusion of a much larger space – delighting the curious wanderer with interesting aspects at every turn. A kitchen garden is set in pots on the backyard veranda, with herbs, strawberries and a number of subtropical plants at the ready for quick harvesting near the kitchen door. 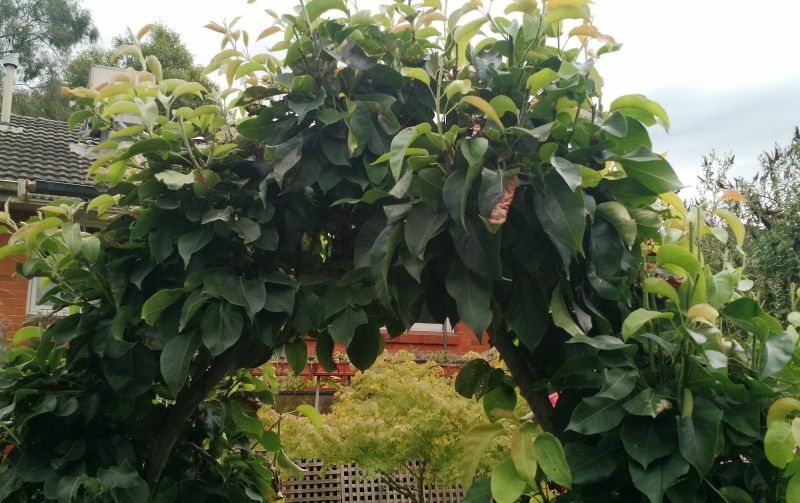 We admire the Japanese ‘Yuzu’ plant (which has a smell like a mandarin), see some white strawberries, as well as plants not commonly grown in Melbourne such as cardamom and turmeric. From the vantage point of the veranda, we can admire Heather’s garden. A non-invasive clumping bamboo plant not only hides the neighbour’s tall house, but also provides bamboo stakes for building, garden edging and mulch, plus bamboo shoots should Heather’s household choose to cook them. Several tall banana plants give one side of the garden a tropical feel, with the leaves being handy for mulch due to their high content of potassium, plus they can be used as serving plates and wrapping food. It’s hard to know where to stop when mentioning the variety of edible plants that Heather grows. Heirloom raspberries (Everbearer) down one fence provide fruit from January to July, two Nashi pears are trimmed to form an arch, as are some grapevines. 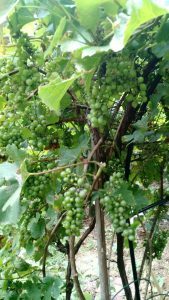 Tea camellia, coffee and blueberry plants are grown in acid-loving soil, there is an asparagus patch, an arrowroot plant, taro, avocado trees (Reed and Bacon), a macadamia and a rare Japanese navel orange. Also planted are a tamarillo, a feijoa tree, cherry guava, mulberry, thornless blackberries, almond and apricot trees, a fig … the list goes on. Plus many different types of veggies. 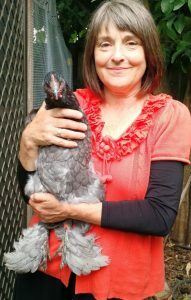 Heather also keeps heirloom chooks known as Cochin. These are very gentle and attach to humans easily. 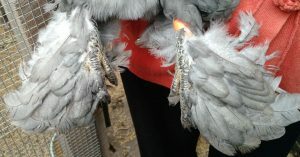 We are amazed at their feathered feet as Heather holds one up. Dandelions and comfrey are grown for the chooks as are arrowroot leaves, which contain lots of protein. Heather uses shell grit for the chooks on the paths instead of gravel. Heather follows permaculture principles in her garden, which include creating heat traps with evergreen edible hedges, using deciduous trees for shade in summer and sunlight in winter, recycling plant produce for mulch, recycling all food waste on-site, taking advantage of where sun and shade fall during the seasons, and directing the flow of rainwater down a slope to a pond (the fish are tame enough to be stroked). Heather has been involved in Permaculture Victoria for 12 years, completed a permaculture design course and has more recently been involved with Permablitz Melbourne, who help people implement suburban permaculture systems. Through Permaculture Victoria, Heather also became involved in running the Whitehorse Urban Harvest food swap at Forest Hill, then another at Box Hill South. Both venues welcome around 20 to 40 local people each month. 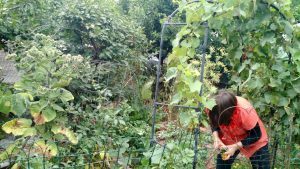 Apart from providing a vehicle for sharing excess homegrown food, Heather says that the Urban Harvests also support people with home food gardening, with members sharing their knowledge in conversations or by giving ‘talks’ on garden topics. It’s also a forum for friendship and a social outing for some. It’s hard to imagine Heather ever slowing down, with her ideas and implementation seemingly endless. Turning a large patch of grass into a thriving urban oasis is a credit to her hard work. Guy and I leave having enjoyed our time immensely. … and Heather’s favourite tomato? ‘Nonna’s Giant’, an Italian meaty Costoluto type, which Heather gave this name to after being given the seed from an elderly Italian lady many years ago. 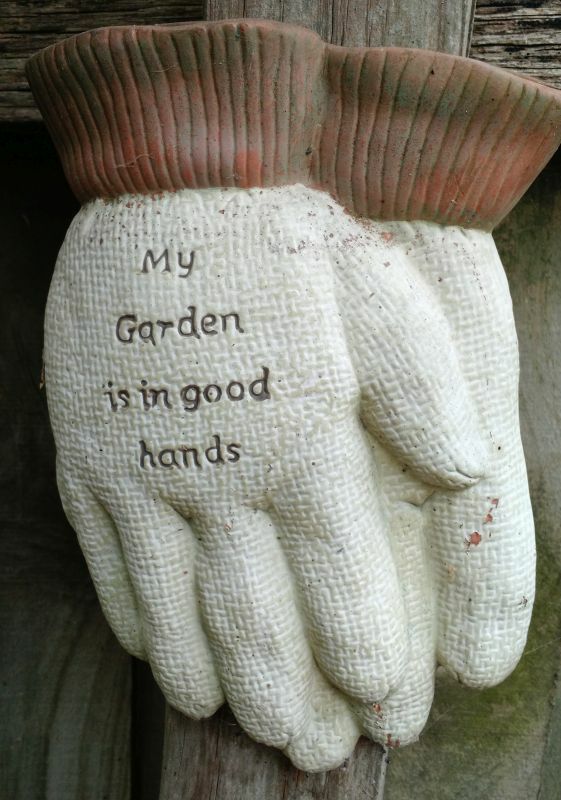 Great article and what an amazing garden you have, Heather. I just attended my first urban harvest on Saturday and it was very interesting. 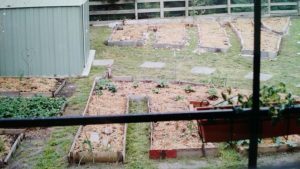 You have created the ideal permaculture garden, which is so rewarding. I continue to experiment with new varieties of veggies and I’m looking forward to meeting you at one of the swap meets!